Stick a child in a swimming pool and, if they are having fun, they often forget or ignore how they physiologically feel. I am sure that we have all told a positively blue child who is shaking like a leaf “that now is a good time to climb out of the water and get dry”. And to hear the emphatic response through chattering teeth, “but I’m not cold”! Children’s sensitive skin also needs protection from UV, sun allergies, sunburn and future skin cancer. The sun can be pretty hot on land. But add water and UV radiation can be up to 90% stronger, due to the reflection of the sun through the water. You can protect your children by covering them from head to toe in a high factor suncream, but this can be challenging and it can have an environmental impact. It was highlighted in June 2016 at the International Coral Reef Symposium in Hawaii that an active ingredient in many sunscreens - 'Oxybenzone' - can be bad for coral colonies. it only takes a tiny amount to wash off the skin to disrupt coral polyps and impact their reproductive capacity. Please check that your sunscreen does not include Oxybenzone. It is possible that it can be included in ‘reef safe' products. A less stick, environmentally positive, more child-friendly protection solution is UV clothing. The iQ-Company has developed an iQ Kids UV Shirt 300 that apparently blocks over 99.9% of UV rays. (This corresponds to a UV protection factor of more than 300). This value was tested / verified by TÜV and tested / certified according to OEKO-TEX100. 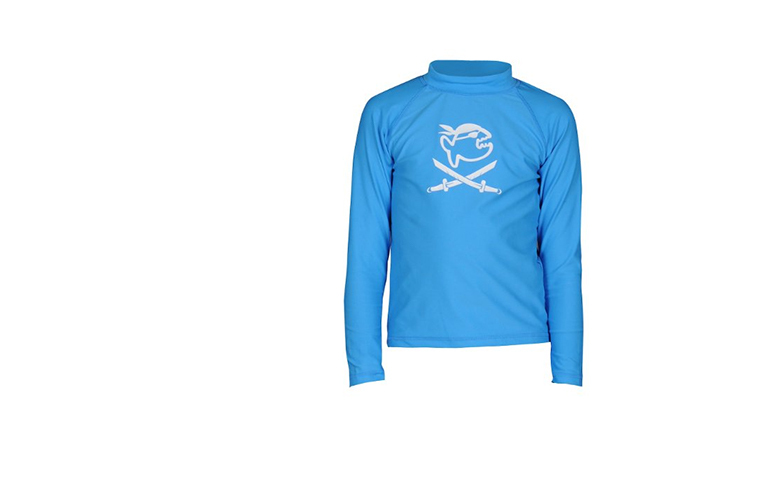 iQ-Company also states that this rash guard protects against certain irritants produced by some jellyfish, sea anemones and corals. The fast drying, breathable, lightweight iQ UV300 material is perfect for all-day adventures in, under and around water, thus allowing your little aquanaut to concentrate on the more important things in life. Romping, running, playing, swimming, paddling and building the biggest sandcastle in the World.